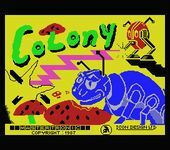 "Colony is an arcade adventure and strategy computer game released in 1987 for several 8-bit computer formats by Mastertronic on their Bulldog label. Owing to overpopulation, humanity has found it necessary to grow food in colonies on other planets. Unfortunately, the mushroom-growing planet that the player is responsible for is also inhabited by hostile native aliens which resemble giant insects. The player must use the droid under their control to maintain and harvest the mushrooms as well as look after and protect the colony itself. Gameplay takes place in a flick-screen environment consisting of the colony itself (which is made-up of storehouses, some specialist buildings, mushroom fields and areas for solar panels) and the surrounding desert of the alien planet which is filled with various giant insects. Colony is quite a complicated game and there are numourous things that the player must look-after." Source: Wikipedia, "Colony_(video_game)," available under the CC-BY-SA License.